What is required of parents and guardians? 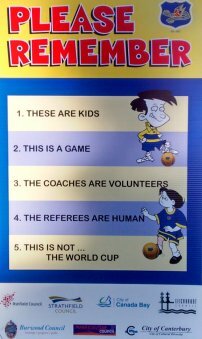 Our Club is run on a voluntary basis and we call on the parents (or any other enthusiastic person who puts their hand up) to manage and coach the teams, act as ground officials at games and help with Club duties. Parents are also expected to abide by the Parents Code of Conduct, which is on this website. It’s not as hard as it sounds. We often have coaching courses at the beginning of the season and are advised of any courses being run in the District, detailed Manager’s Packs are given to each team, and the Committee members are here to support and assist. A list of Ground Official’s duties is available on this website. To carry out any of these “official” jobs, you need to register with Canterbury District Soccer Football Association (CDSFA). This is for the protection of all, ensuring you agree to abide by the appropriate CDSFA Code of Conduct, are not a Prohibited person under the Child Protection Act, and most importantly, are covered by the relevant insurances provided by Football NSW. The Canteen is our major source of fund raising. The funds raised have and will continue to contribute towards the the equipment used by the players and, very importantly, the trophies at the end of the season. It costs approximately $500 every year to equip one team. Each junior team will be assigned Canteen Duty for games, about twice a year, when you have a home game at King George Park. This will be discussed with you by your manager. Please also offer to help out on training nights, whether serving behind the counter or staffing the BBQ. It is very difficult to do everything on your own, and it can be the warmest place in the Winter. Most importantly, please support the canteen as a customer on training nights and match days. If you have a Home Game at King George Park, Balmain Road Playing Field or Sydney Secondary College Leichhardt and are the first team on that field for the day you will be asked to set up the field. All team members should arrive at least 45 minutes before kick-off and be prepared to help. If your game is late starting it will be cut short to enable the following game to begin on time. Our Ground Manager will be there to open the container, get the equipment out, and make sure you know what to do. Fields for small sided games (played this year by under 6s and 7s), obviously do not take as long to set-up, but parents should still be available to help. If you are the last team on the field for that day you will be asked to pack up. Please do it neatly as it makes it much easier for the next team who has to set up. The Ground Manager and/ or your manager or coach will instruct you on how to do this and where the equipment is kept. The draw will indicate whether or not you are the “Home” team (King George does not have enough fields to allow all Home Games to be held there – it is possible to have Home Games at other fields, however you may not be expected to set up their fields). Parents or players in each team should take turns in taking the shirts home to be washed after each game. These should be kept together, and returned to the Club at the end of each season. Often that same parent is asked to bring the oranges (for half time) for the game the following week. All this should be organised on a roster basis by your manager. U6, U7 and U8 plus often U9 U10 and U11 teams need to provide a referee if their game is a Home Game. Make sure someone on your team has a whistle, therefore. You should be provided with one in your kit, and some canteen have them for sale. Any unbiased parent can do it. For U12 and up, CDSFA usually provide an official referee – and often a linesman or two. If not, the Home Team may be expected to provide the referee and both teams can provide linesmen. Both teams have to agree to using the “unofficial” referee.